Beijing has been accused of building “island fortresses” in the South China Sea after a newspaper in the Philippines obtained aerial photographs offering the most detailed glimpse yet of China’s militarization of the waterway, as the Guardian reports. Separately, satellite images analyzed by CSIS reveal North Korea is developing bases for its fleet of assault hovercraft that will be able to deploy elite special forces on South Korean soil in half an hour, as the Telegraph reports. Dive Deeper : See the CSIS Asia Maritime Initiative microsite for more on island-building in the South China Sea. And, read the full analysis, “North Korean Special Operations Forces: Hovercraft Bases,” on CSIS’s Beyond Parallel. Vice President Mike Pence said he wouldn’t rule out a meeting with North Korean officials when he attends the Winter Olympics in South Korea later this week, as the Wall Street Journal reports. Dive Deeper: “North Korea Diplomacy and the Winter Olympics,” from the CSIS Korea Chair. Iran's President Hassan Rohani has again ruled out negotiations on the country's missiles program, as Radio Free Europe reports. Iran insists its ballistic missiles, which are not covered by the nuclear deal, are used as defensive weapons rather than as weapons of mass destruction. Dive Deeper : View Iran’s ballistic missiles on CSIS’s Missile Threat. As Reuters reports, the United Nations called on Tuesday for an immediate humanitarian ceasefire in Syria of at least a month, as heavy air strikes were reported to have killed scores of people in the last major rebel stronghold near Damascus. The number of precision-guided munitions dropped from a B-52 on Taliban positions in Afghanistan over the past 4 days. — U.S. disarmament ambassador Robert Wood. SpaceX’s Falcon Heavy is able to launch the company's heaviest payloads into orbit. Learn more about the Falcon Series on aerospace.csis.org. 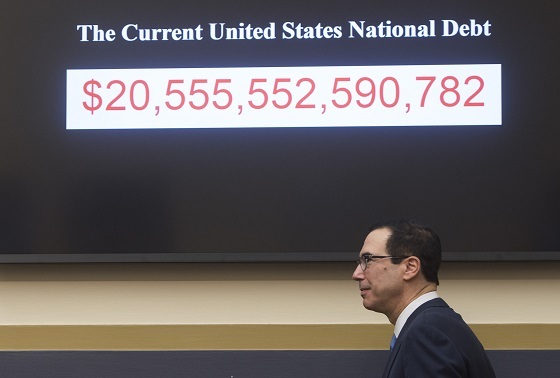 (Photo Credit: SAUL LOEB/AFP/Getty Images). United States Secretary of Treasury Steven Mnuchin leaves as he testifies during a House Financial Services Committee hearing today on Capitol Hill. “Russia and China vie to beat the US in the trillion-dollar race to control the Arctic,” by CNBC’s Clay Dillow. Join the CSIS Europe Program at 11:00 a.m. for a conversation with Timo Soini, Minister for Foreign Affairs of Finland. And at 10:00 a.m., join the Brookings Institution for a discussion on President Donald Trump’s impact on democracy. Today, CSIS hosted Russian presidential candidate Ksenia Sobchak for a discussion on Russia's post-authoritarian future. In the latest episode of the Building the Future podcast, James A. Harmon, Chairman of the Egyptian-American Enterprise Fund (EAEF), discusses the obstacles he had to overcome to make enterprise funds successful in Egypt. There are a lot of Wilco fans out there, and I received a lot of emails from them about the band’s reissue of “Being There.” Here’s what Wilco looked and sounded like when they first released the album.